Make the caramel sauce- in a small saucepan, heat sugar over medium heat. Use a heat-resistant spatula to continually stir the sugar. It will start to melt and from brown clumps. Keep stirring! Once the sugar is melted, add the butter. Be careful to keep stirring as the caramel will bubble up when you add the butter. Stir the butter until completely melted, 2-3 minutes. Continue stirring as you slowly drizzle the cream in. Keep stirring again, because the caramel will bubble up again when you add the cream. allow the mixture to boil for 1 minute, then remove pan from heat. Immediately stir in the salt. Set sauce aside and allow to cool before using. Store in a glass jar for ease of use, keep sauce in the fridge. Preheat oven to 300º. Thoroughly grease a 9-inch springform pan. Set aside. Get full recipe and instructions, please visit here jessicaerinjarrell. 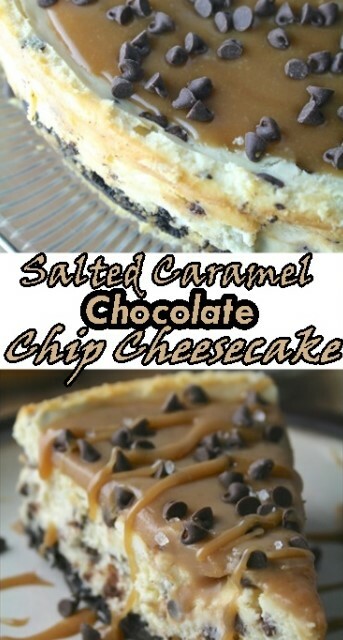 0 Response to "Salted Caramel Chocolate Chip Cheesecake"